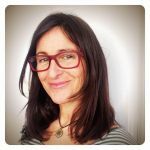 Rocio Bonilla (Barcelona, 1970) has a Fine Arts degree and created 'Érase una vez', a mural painting project, after more than a decade working in advertising. Later on, she started her career as a book illustrator with 'Cara de pájaro' ('Bird Face'), her first solo picture book published with Algar, with whom she has also published 'La montaña de libros más alta del mundo' ('The Biggest Mountain of Books in the World'), '¿De qué color es un beso? '('What Colour is a Kiss?) and 'Los fantasmas no llaman a la puerta' ('Ghosts Don't Knock At The Door'). Oriol Malet (Martorell, 1975) is an established illustrator who combines personal projects with ongoing collaborations with various publishers and media outlets. He has also provided album artwork for musicians and has been contributing to the parenting blog Vadepares.cat since 2014. He was awarded Òmnium Cultural's Llança prize in 2012 and 2014.